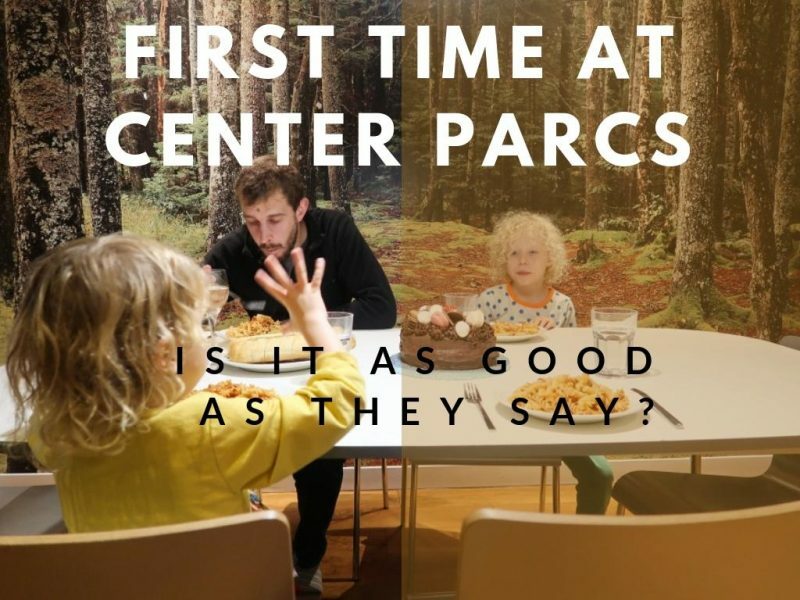 Center Parcs For First Timers, Love It Or Hate It? 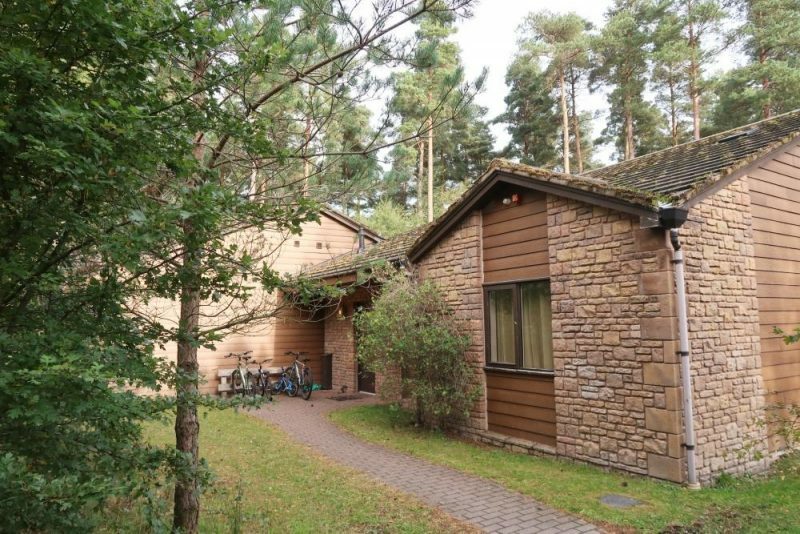 We seem to be in the minority of our friends and have never been to Center Parcs, until this month of course! I wasn’t quite sure what to expect as we’ve never stayed somewhere which has EVERYTHING you need to be entertained for a week and half expected we spend a day off site. But that didn’t happen, we arrived at 11am on the Monday and stayed all the way through to Friday morning without leaving the site. 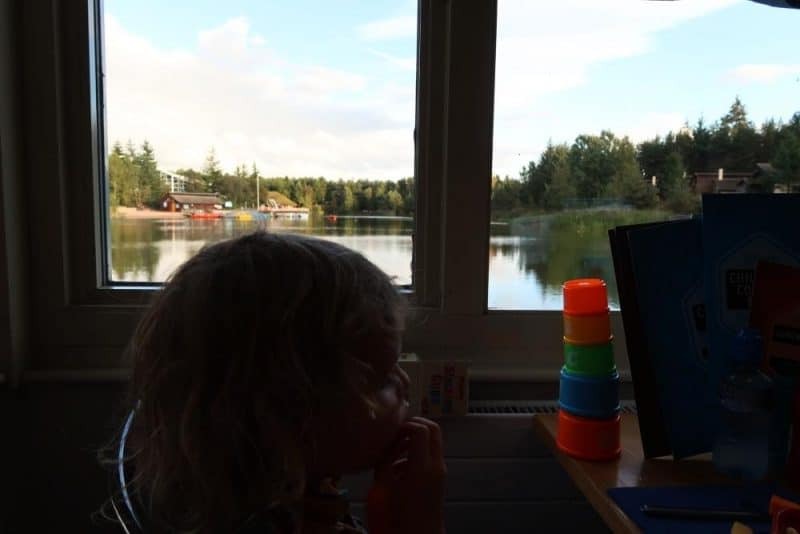 It’s only a two hour drive from where we live in the Scottish central belt to Center Parcs at Whinfell Forest in Cumbria, so not a long journey at all. Although did feel a little bad for our eldest as it was his birthday on the Monday that we headed down. But we still had plenty of time to open his presents at home and I wrapped a few random gifts for him to open on the journey and for when we arrived at the lodge too. He seemed very happy with how his birthday turned out! The drive down was easy and the kids listened to music and played with their books. Our youngest is 4.5 and is still rear facing in his Axkid Minikid car seat, great for keeping him safe, although a bit difficult to hear what he’s saying sometimes! 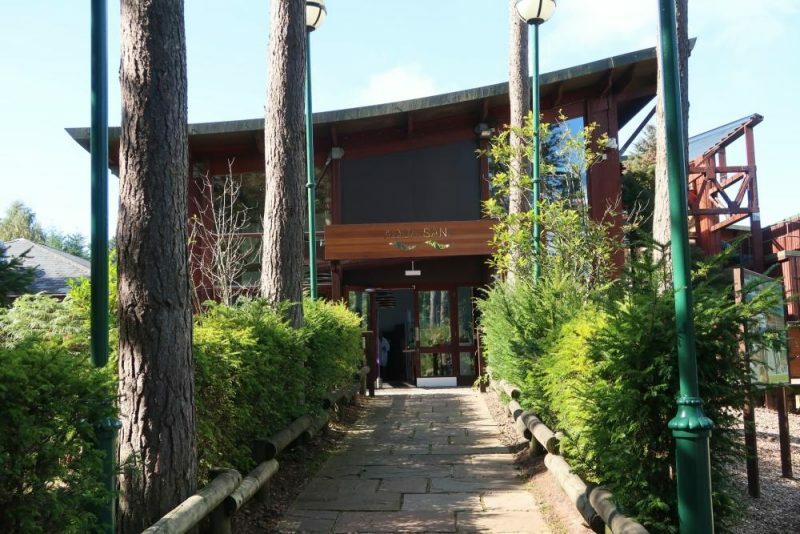 When you arrive at Whinfell Forest you go through a drive-through check-in, something that we had never done before! It felt a bit weird driving into the building. They ‘cut our keys’ really programming a chip in the wristband which is not only a key for your lodge, but can be used as a key for the lockers at the swimming pool, spa and boathouse too. We did have a programming issue as the wristbands weren’t cut correctly, so we couldn’t access our lodge with them. A quick trip back to guest services desk in the village centre took care of that though. You can book early arrival to your lodge for 2pm rather than the usual 3.30pm, which was what we were given for our stay. Of course we chose to arrive a lot earlier than that as you are able to use the facilities in the village from 10am. What else would you choose to use on arrival but swimming?! 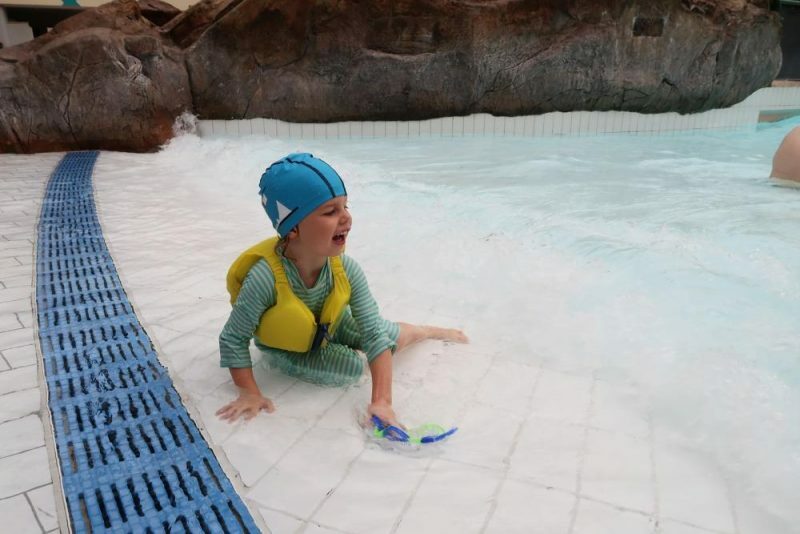 Our eldest was very excited about the pool especially as it had a wave pool, which is incredibly exciting when you’re 7 and only ever been in ‘normal’ swimming pools! The swimming complex was potentially the boys highlight of the week, they wanted to swim every single day. As I mentioned before you could use your wristband for the lockers, so you didn’t even need to worry about carrying around change. The kids also seemed excited about the changing rooms which all seemed to open to directions, so you could enter one side and go out to the lockers on the other. Simple design, but certainly makes life easier and keeps shoes and bare foot areas a bit more separate. Inside the swimming paradise is the wave pool, which our eldest loved. Every half an hour the siren goes off and there are fairly big waves, he dived under them and littlest stayed in the shallow area pretending to defend me from the waves (picture ninja kicks at the waves!). As our youngest can’t swim yet we borrowed one of the buoyancy aids which are hanging up for use by any child just beside the wave pool. It definitely gave us peace of mine in deeper areas and took a bit of weight off our arms when holding him and swimming. On one side of the wave pool is the children’s area, which has very shallow areas suitable for babies, a couple of slides for toddler/preschool age and a mini splash park area where they can run about under sprays of water. On the opposite side of the wave pool is a small river rapid, which is always fun to whizz round and a jacuzzi type seats under a water fall area. You also need to cross that direction to get to the various slides and flumes. Neither of our two wanted to go down the flumes, even though our 7 year old was the correct height. I did see plenty of children his age or younger go into the first flume, which ends on the flume and you don’t get dropped into a pool. However I wouldn’t recommend the canyon flume to younger kids unless they were good swimmers. Simply because you get thrown around a lot and then plunged into deeper water at the end! My husband and I tried out both though! The slides the kids loved were the two open slides side-by-side near the activity pool (used for various water activities like scuba diving and aqua jetting). My husband and eldest son enjoyed racing each other down the slide, plunging into the warm water below and littlest liked to go down with me, as long as I kept his head above water at the end. One day he will be happy going under like his brother, just clearly not yet! There are also several spa pools, an outdoor pool (actually really warm!) and several cabanas that you can hire for use as a group. Suffice to say the pool complex was brilliant and something that is included in the price of your stay. Always good for those wet afternoons too! We had early arrival booked for 2pm entry into our lodge, unfortunately communication wasn’t great and the cleaners at our lodge didn’t know that. So when we arrived at 2.45pm after lunch and a swim they still weren’t ready for us. Fortunately the cleaners were great and got it all sorted for just after 3pm, but perhaps the booking system needs to have better communication with other services. I couldn’t fault the house keeping team on the state of the lodge though, it was immaculate! We were given a grocery pack to keep us going through our stay, although I think it was more than the four of us needed! 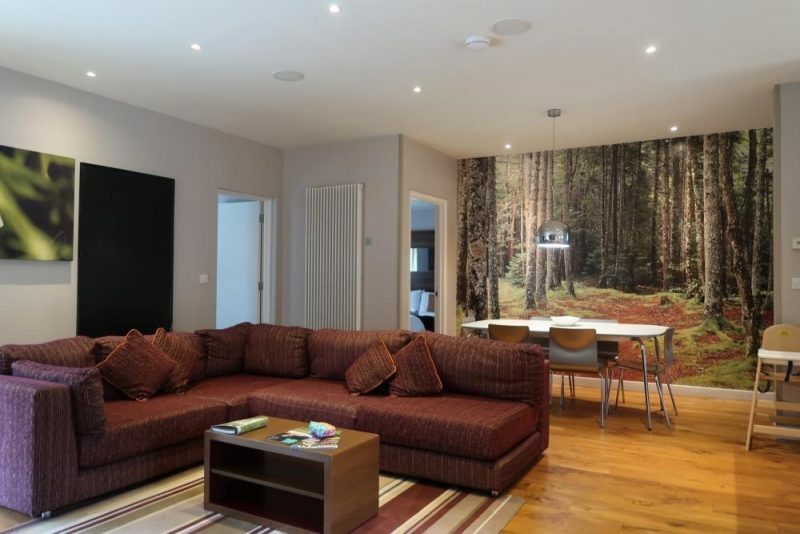 Our lodge was in Bilberry Wood and consisted of a large open plan living/dining/kitchen area, 2 double bedrooms and one twin bedroom coming off the living area. Despite being right across from the main play park and the road, it was never very noisy at the lodge at all. We also had a sauna and small patio area with outdoor table and barbecue, we didn’t have the weather for it ourselves, but that must have been a great space to use in the warm summer months. The kitchen had all the utensils, pots and pans you would expect. We loved having a dishwasher and once we worked out how to light the oven it was easy enough to use too. Each bedroom was ensuite, so everyone had their own space to use, everything was clean and housekeeping came every day to clean the lodge, although we did choose to put the no cleaning required sign on the door handle for the second day. The lodge was in need of a little TLC in some areas, nothing serious, but just a slightly bashed wall area at the front door, a toilet that creaks and moves slightly as you sit down and patio doors that are a bit too wobbly. I’m sure these things will be repaired in time and they certainly didn’t affect our stay. 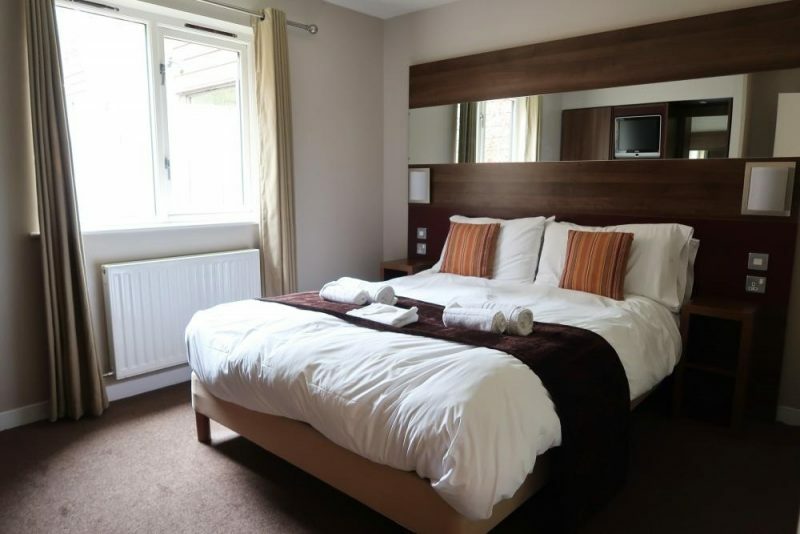 There are lots of different styles of lodge available, varying in price for the size and location of lodge. There are also some new lodges being constructed on site, including a massive 6 bedroom lodge that can sleep up to 12 people! 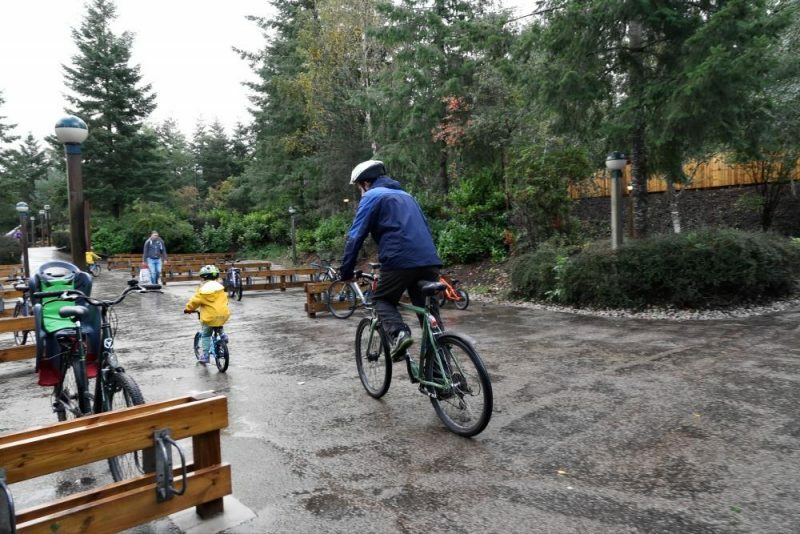 Outside each lodge is a bike rack so you can safely store and lock your bikes in place. We took our youngest’s pedal bike as we weren’t sure they would have pedal bikes in his size without stabilisers, but hired bikes for our 7 year old, my husband and I. The bike hire was quick and painless, you also get a bike lock each and the staff were friendly and efficient. We used the bikes each day to cycle around the site and I can see them being especially useful if your lodge is further away than ours was. Whinfell is a little hilly, so younger kids may need some help getting back up the hills, although will probably be happy enough free wheeling down! The bikes were all in great condition and we didn’t have any issues with them. If there are any problems you are able to go back to the cycle centre where there is a bike repair centre too. All of the road around the site are available for cycling on and many paths too, although certain paths have signs to show they are for pedestrians only. We still managed to get around easy enough and our 7 year old loved ringing the very loud bell to warn pedestrians that he was behind them! There are HUGE amounts of activities available and although you and the kids may want to do them all, that would cost a fortune! SO it’s probably best to choose a couple each and book them in advance. Then you can add in other things when you’re there and find out what the kids really want to do. 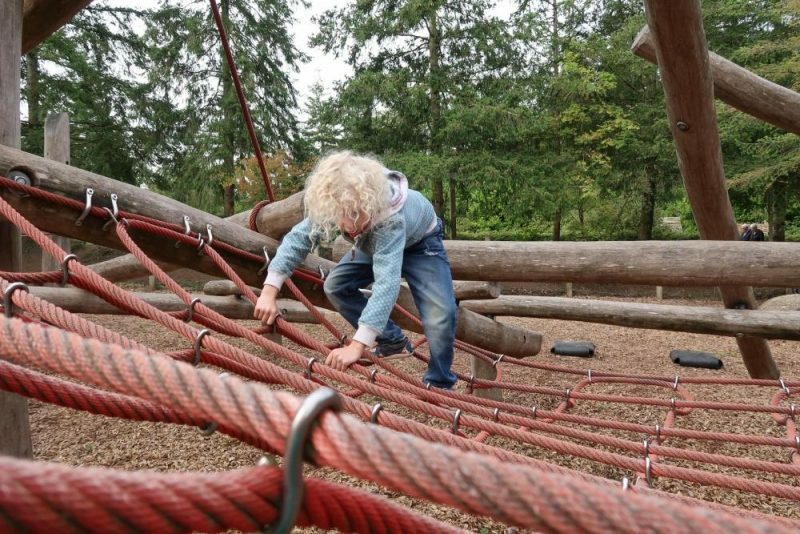 Most activities have age or height restrictions, so our small 4 year old (grow child, grow!) wasn’t able to do the same as his much taller brother. But we were able to find plenty of other activities that were suited to younger kids. We booked Little Outlaws for the 4 year old and the Aerial Adventure for the 7 year old in advance. The Little Outlaws archery session was a compromise as our youngest was desperate to do the ropes course too, but he is 7 cm too short for the lower ropes course. There is a toddler mini Tree Trek, but this would be far too easy for confident preschoolers who already race around much more dangerous things at the park! 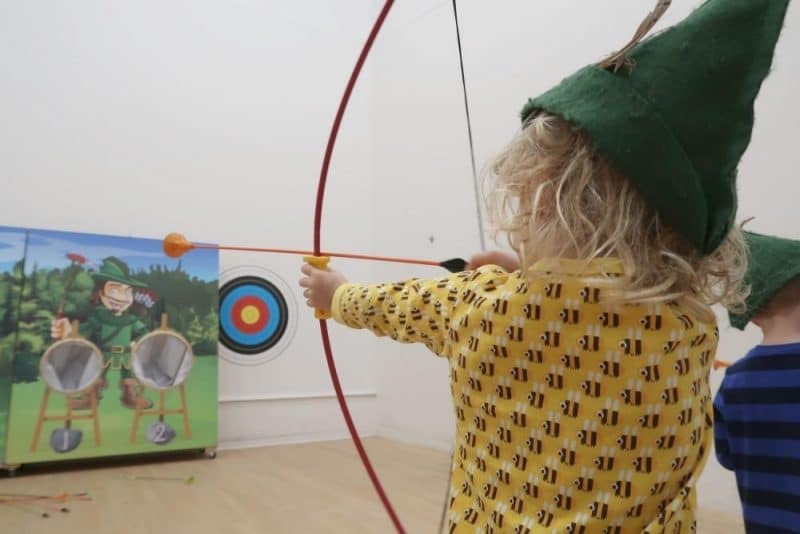 The Little Outlaws session was brilliant for our 4 year old, who already has a love of bow and arrows from various visits to castles. He got quite good at using the bow, but needed a little help with the aim. I felt quite competitive when I was given a go, especially as I was trained to teach archery as an outdoor instructor many moons a go! At the end of the session he was presented with a pin badge, which he was very proud of, almost swaggering back to the ropes course to show his dad! 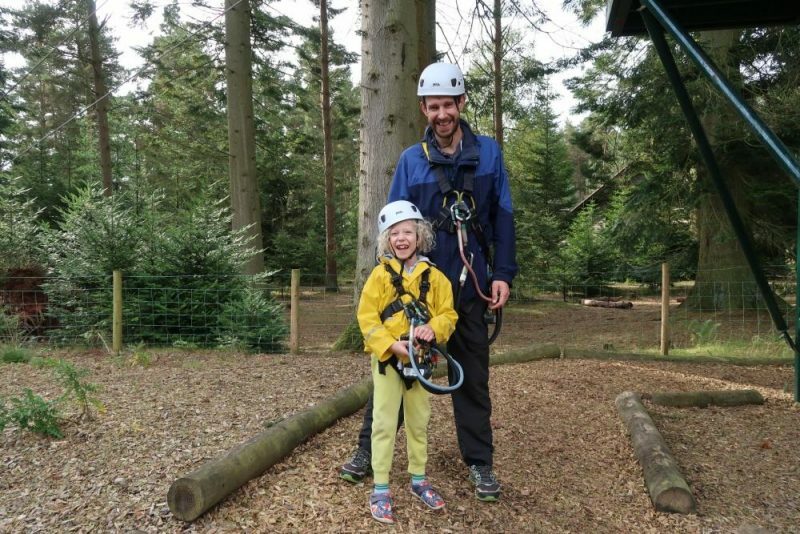 When we arrived back at the Aerial Adventure my husband and eldest were already part way round the course. 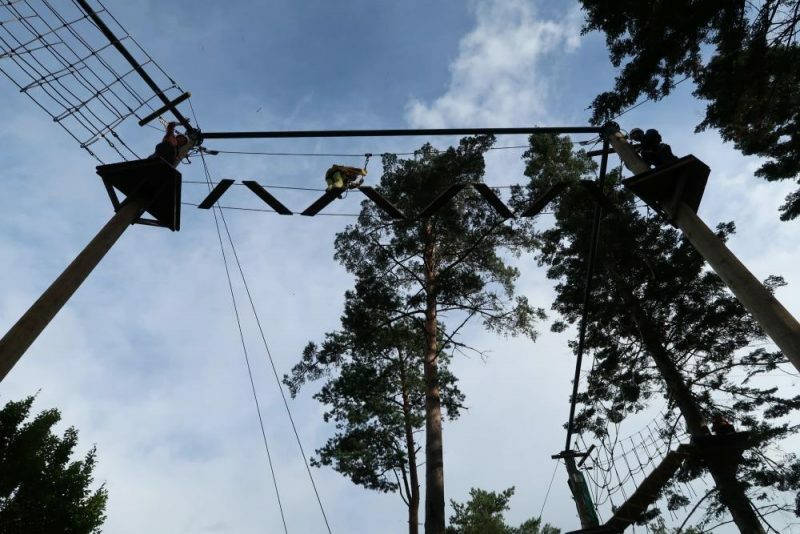 Our 7 year old is almost exactly the minimum height for this activity of 1.22m and I was slightly concerned he wouldn’t be able to complete it all, but he was amazing and steadily completed the whole course without any wobbles at all. Flying down the 100m zip to the finish! I think he spurred on many of the adults doing the same course as there’s no way they could admit defeat when they could see a young child completing it in front of them! He was also given a pin badge for this activity, which clearly you could collect as you go to various activities around the site. After the successful activities we decided to book the boys into two more for the next day. Our eldest wanted to try out the indoor caving experience and our youngest (who couldn’t do caving as you need to be 6 years old) chose the pony trekking. Caving turned out to be a fantastic choice and even though it was in a plastic cave they had to squeeze through holes and gaps, finding cave paintings, fossils and stalagmites along the way. The only downside was that the instructor would go out a hatch to get around he group int he cave and each time he did so they could see a carpeted room, which takes the effect of being in a cave away a bit. My eldest did love it though and was pleased to add a glow in the dark pin badge to his collection! Youngest and I had a longer bike ride up past the outdoor centre and out of the park to find the stables. For younger children I would recommend some sort of transport to get them to the stables as it’s a long way for them to walk. At the stables you’re told which pony you will be given based on height of the child and wait until they are brought up from the paddock to mount. Our littlest was very excited as his pony was called Mac and he couldn’t wait for his ride. 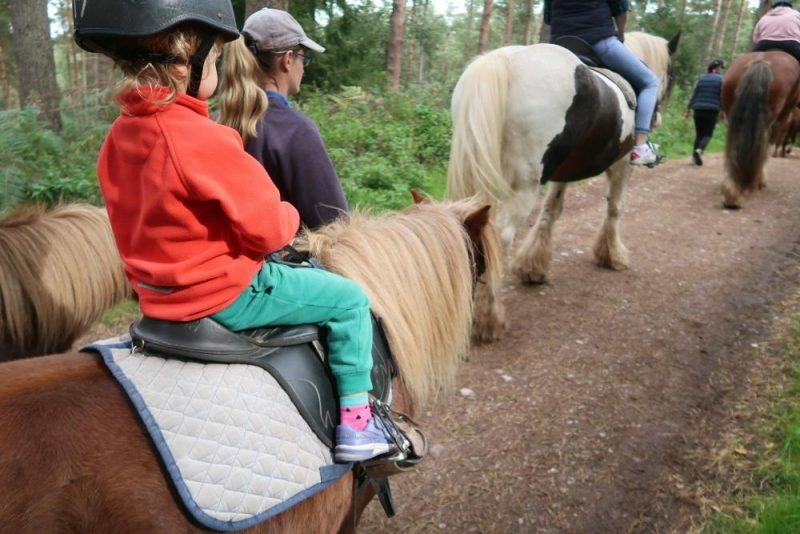 On the pony they sit up straight and hold the loop at the front of the saddle with two hands. Of course our little monkey decided to show me how he could hold on with only one hand. I was just waiting for him to start standing on the pony’s back and show me tricks! Ha ha! At the end of his pony trek we bought a rosette, a bit different to the pin badges! 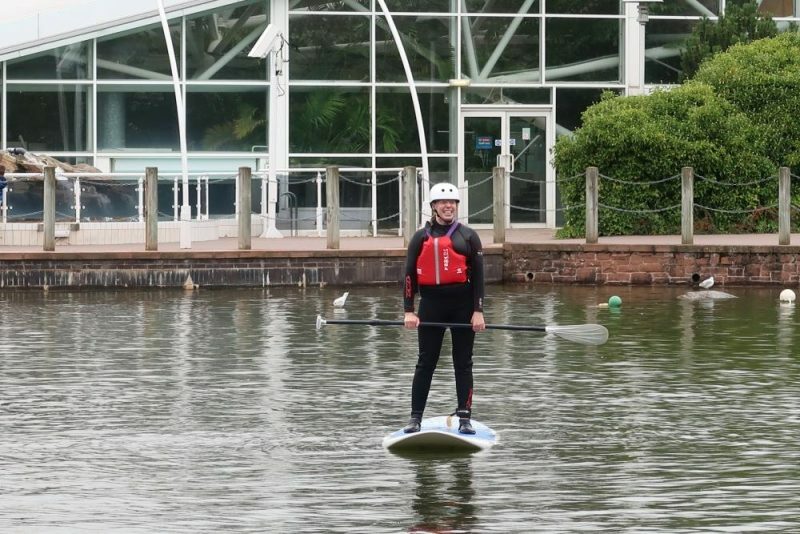 I chose to take an hour long Stand Up Paddle Board tuition, which was great and although we fell in A LOT I felt I had achieved something at the end. It’s a very good spectator sport and my family (especially husband) took great delight in watching us fall in! If you do spot paddle boarder on the lake then it’s probably a good idea to settle down on the seats by The Pancake House to watch! I’ll write another post with a bit more detail about the activities later, watch this space! The Aqua Sana spa is used by guests on site and those who are visiting for the day. It’s probably best visited with friends or family, otherwise it can get a bit boring sitting in the steam rooms on your own! But there’s plenty of places for reading a good book or enjoying a kip on the lounge chairs or water beds. There are lots of different steam rooms to choose from, including dry heat rooms like the Tyrolean (don’t forget to use the ice shower afterward) to the Turkish or Japanese steam rooms which are HOT! Took me half a minute to get used to the heat enough to sit down on the tiled seats! There is a reflexology pool and outdoor pool to relax in, plus footbaths which I loved. 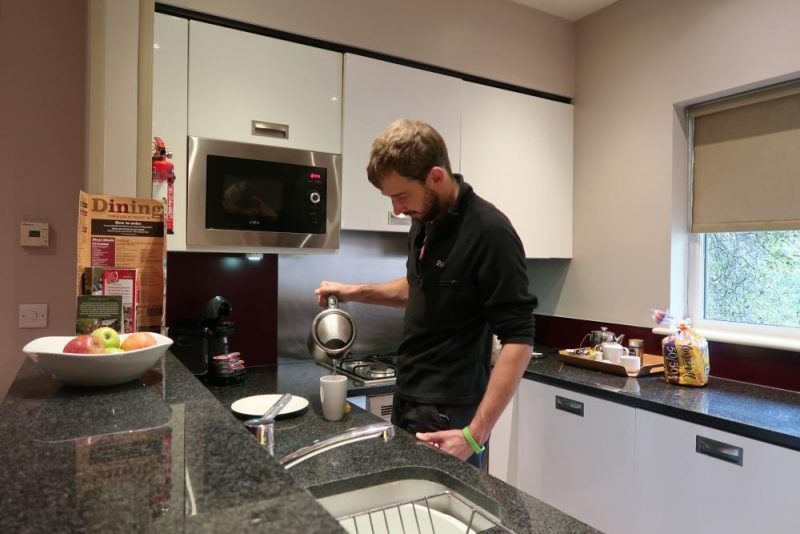 As you are going in and out of steam rooms it’s recommended to drink plenty of water, which is available in the main area of the spa, plus there’s a cafe just outside the spa room itself. I didn’t book any separate treatments, but they are available if you would like to enhance your spa experience further. 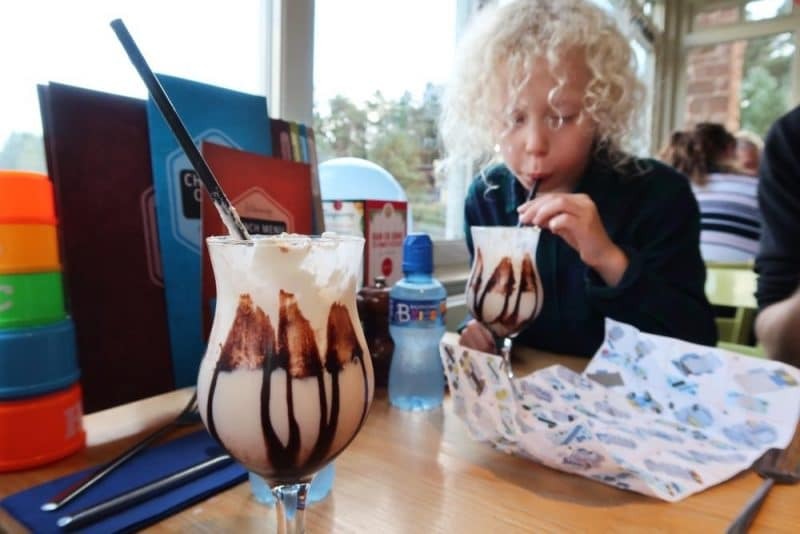 At the centre of Whinfell Forest is the Village Centre, where there are plenty of cafes, restaurants shops and creche available. 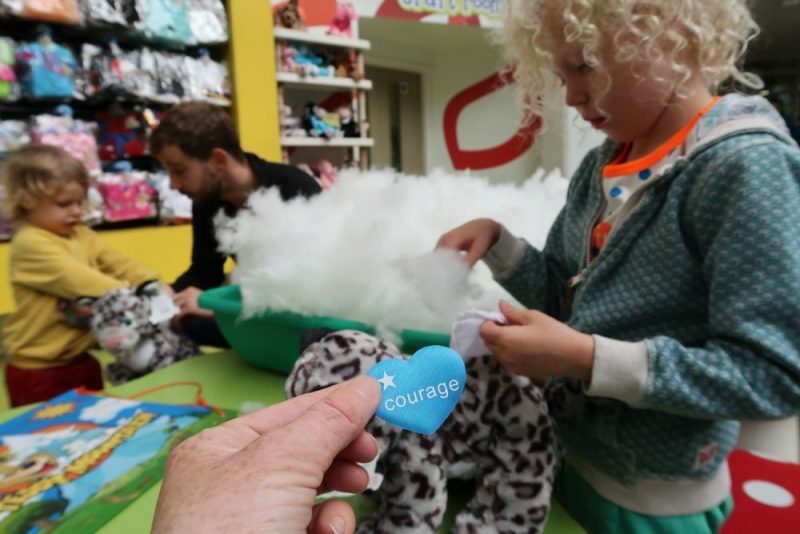 Our boys chose to make their own soft toys in the children’s area and there seemed to be plenty of craft type activities available to book too. They loved making their snow leopards and spent a lot of the time in the lodge playing games or just cuddling them! We ate at various eateries for lunch, but forgot to book a table for dinner on the Thursday night and realised that everywhere was full. So I would definitely recommend booking dinner tables in advance, although you will probably be fine for dropping in at lunch time. 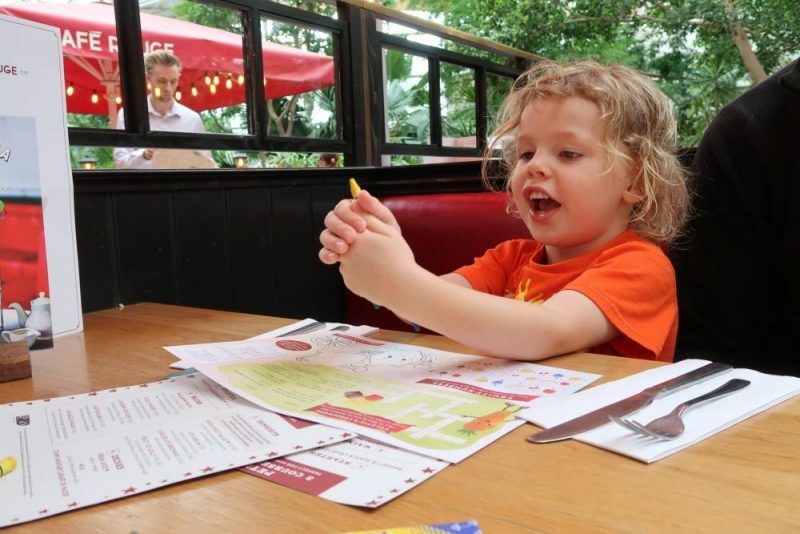 The Pancake House was a favourite because, well pancakes! 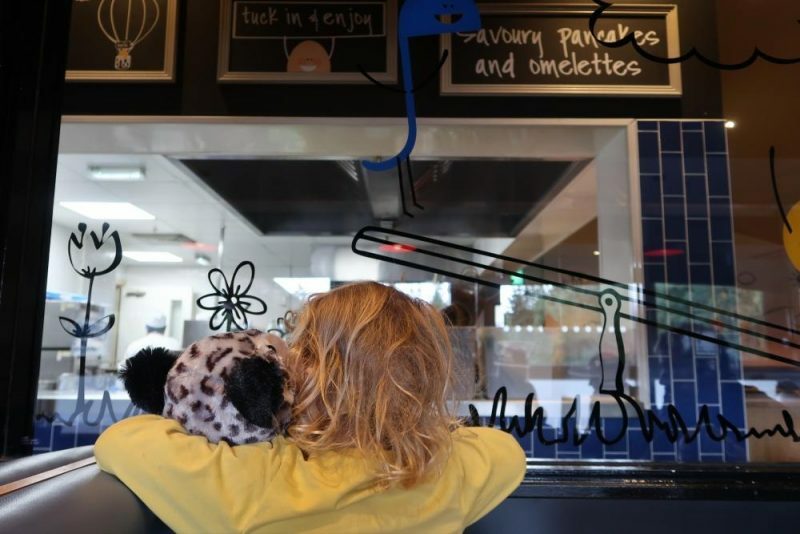 But we also had a great burger after swimming one day in Dexter’s Kitchen and lunch at Cafe Rouge on another afternoon (a favourite of the kids due to the play area above the cafe). All our meals were delicious! The ParcMarket was well stocked with most items you needed, although perhaps a bit more expensive than normal supermarkets. You could also get dinner delivered to your door through the take away service too, something we didn’t try, but maybe next time! The only other shops we visited were Treats (sweet shop) and the toy shop, which had a fantastic train and a little Lego station to play in too. If we stayed again we would probably also visit the Leisure Bowl for a game, it’s been a while since we went bowling! We had a special meal booked for our first night as it was our son’s birthday. So we had dinner at the lovely Lakeside Inn, looking out at the lake from our table. It’s at the opposite end of the lake from the Village Centre entrance, but you can easily walk round. The meals were delicious and reasonably priced from our experience. 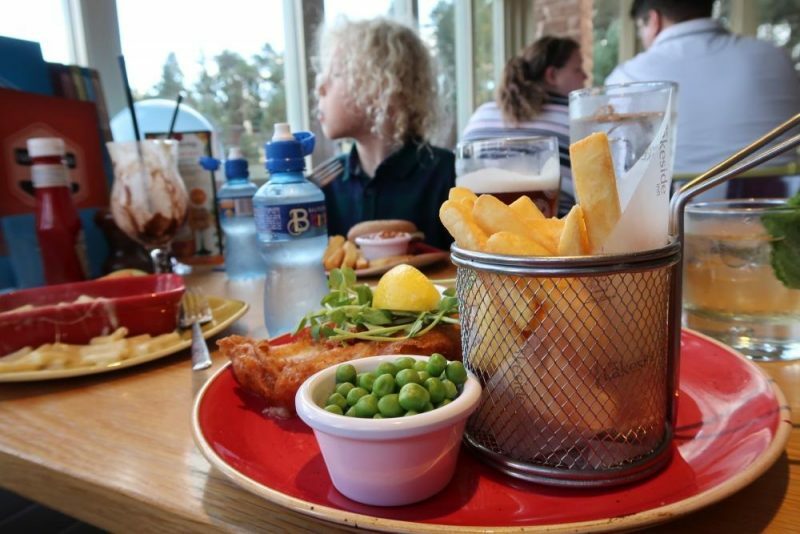 My husband chose the carvery and I had fish and chips, the kids each chose from the kids menu and even had a special children’s ‘cocktail’ each. The staff were lovely and had even put up a birthday banner and had balloons on the table for our arrival. This thrilled our children as they LOVE balloons, even when they burst! The restaurant is bar service, so we chose our meals and I asked for everything at the bar. Fortunately I think I got it all correct, as I am known to not listen correctly to what everyone asks for. Although I did mess up on dessert and got my husband ice cream instead of custard with his pie. Whoops! The Lakeside Inn also has a soft play area to use, although we didn’t make use of it whilst we were there, the kids were too busy with other things. I also created a video of our stay, you can check it out below. 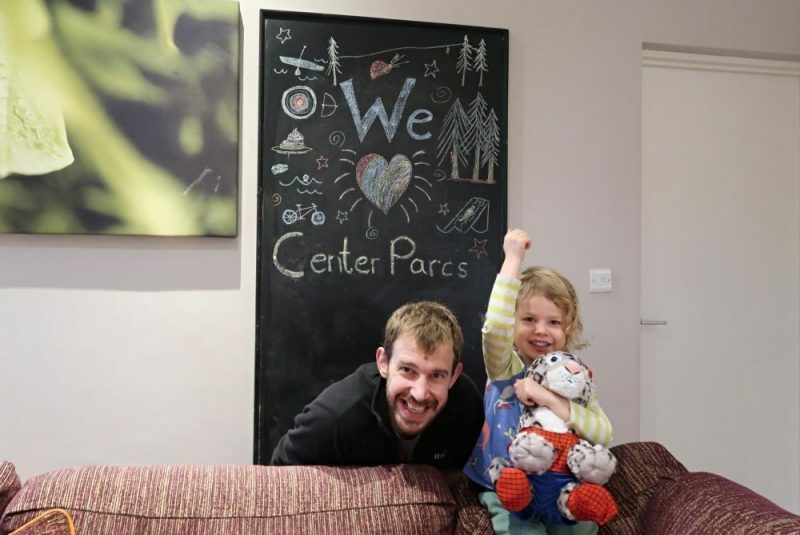 I would definitely say we LOVED our Center Parcs trip and will definitely be coming back again for more adventures. It’s amazing how much fun you can have in one place! 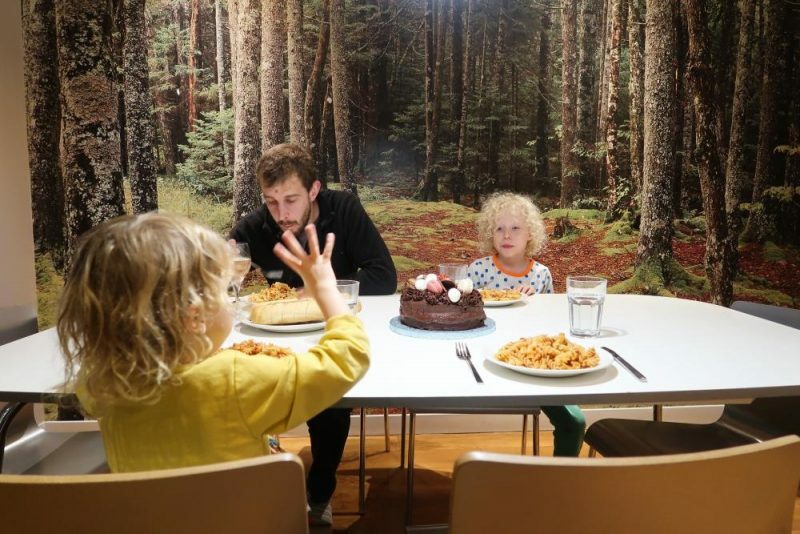 * We were hosted at CenterParcs and some (not all) of our activities and meals were paid for on our behalf, however all opinions are my own. Centre Parks is a great holiday to take as a family, so many things you can do and have fun at the same time! 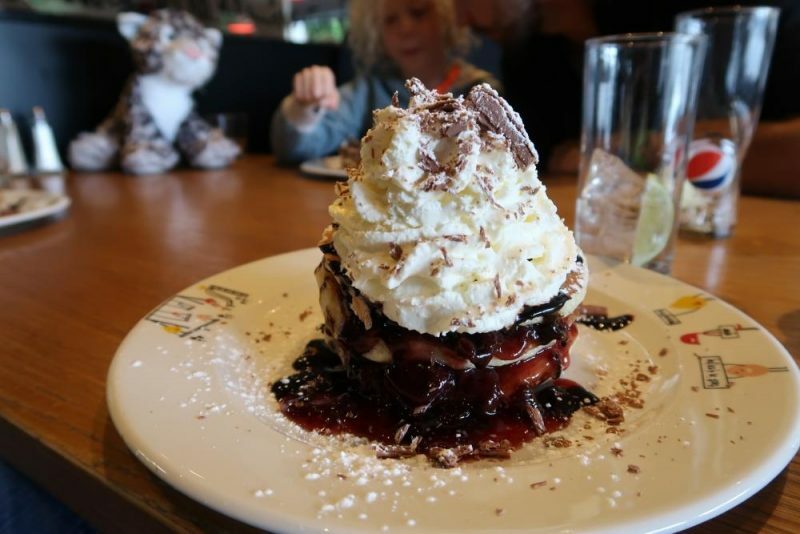 I’ve been to Centre Parcs recently and had a great time, there was enough to do for the time we were there!